Saviour Pirotta has a well deserved reputation of writing some of the best books for children about Ancient Greece myths. His versions of many other traditional folk tales, myths and legends grace the shelves of pretty much every school library. His wonderful gift for storytelling has turned many often dry or complex stories into ripping yarns that read aloud beautifully. This is no exception, but in the form of an attractively illustrated novel. This story takes elements of legendary tales and weaves them into the lives of two very clever young people - Nico and Thrax. Their everyday lives in Ancient Greece are the backdrop for a mystery that only they can solve. Their unique skills will help them prove their friend's innocence. The characters are instantly likeable, and this makes for a very enjoyable read. The story is just challenging enough to please teachers and parents, but absorbing enough to quickly hook children. At its heart, it's a really great story that primary age children will love, but older struggling readers will also find a lot of enjoyment here too. Complex themes of friendship and loyalty mix in with the adventure to make a cracking story. Coupled with Freya Hartas' charming and detailed illustrations, this makes Mark of the Cyclops the first in a series you should definitely put on pre-order. A great read. I liked it a lot. 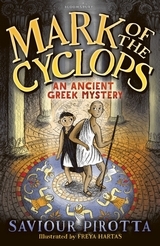 Mark of the Cyclops is published by Bloomsbury. The next in the series (Secret of the Oracle) was published 5 October 2017. Dawn Finch, children's author and librarian. Past President CILIP. Member of the Society of Authors' CWIG committee..